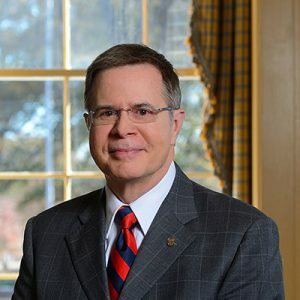 Jeffrey S. Vitter is the 17th chancellor of the University of Mississippi, as well as Distinguished Professor of Computer and Information Science. He is a renowned computer scientist, a passionate advocate for higher education, and an avid reader. His 37 years’ experience at noted universities Brown, Duke, Purdue, Texas A&M, and Kansas culminated in his “dream job” when he became chancellor of Mississippi’s flagship university in January 2016. Since then, the University of Mississippi has attained the Carnegie R1 highest research activity designation, placing the school in the top 2.5% of the nation’s colleges and universities. It is the state’s largest and top-ranked university and has set records for student admissions, credentials, and retention. Fueled by his belief in the power of higher education to transform lives, communities, and the world, Dr. Vitter has charted the university’s momentum to achieve ever greater heights. Ole Miss continues its long legacy of leadership in academic excellence with a $1 billion building program including a state-of-the-art STEM building, creation of superlative networks of faculty called Flagship Constellations, major community partnerships, and greater capacity and reach of the University of Mississippi Medical Center. In addition, Dr. Vitter relishes his role as the voice of the university. Since arriving at Ole Miss, he has greatly expanded communication and connectivity via town halls, informational blogs, and robust use of social media. He and his wife Sharon are often seen around campus, in the Grove, at athletic events, and on restaurant stools throughout Mississippi, getting to know people the old fashioned way. A New Orleans native, Dr. Vitter holds degrees from Notre Dame, Stanford, and Duke. His wife Sharon is a native Kansan and a pharmacy alumna of KU. The Vitters and their three adult children Jillian, Scott, and Audrey are passionate about the arts and genealogy and are avid sports fans.